The first time I watched My Big Fat Greek Wedding, I laughed hardest at the dad who sprayed Windex on every problem. Not only because it was funny, but because I had grown up with a mother who had her own particular panacea for all that ailed us - Bag Balm. Got a big bite? Bag Balm. Sunburn? Bag balm. Infected nose piercing you weren't supposed to get? Bag balm. Despite not having used it in 20 years, I still remember the acrid smell and sticky consistency that sat in the top shelf of her bathroom cupboard in its green tin throughout my childhood. This salve has replaced Bag Balm in my own kids' lives, so much so that they often fetch the jar before they come to me crying with scrapes and bites. The making of this salve has become one of our early summer rituals for years and we always have some tucked away for whatever we might need it for. I start scouring the hedgerows as soon as its warm enough, stockpiling jars to last us throughout the year. 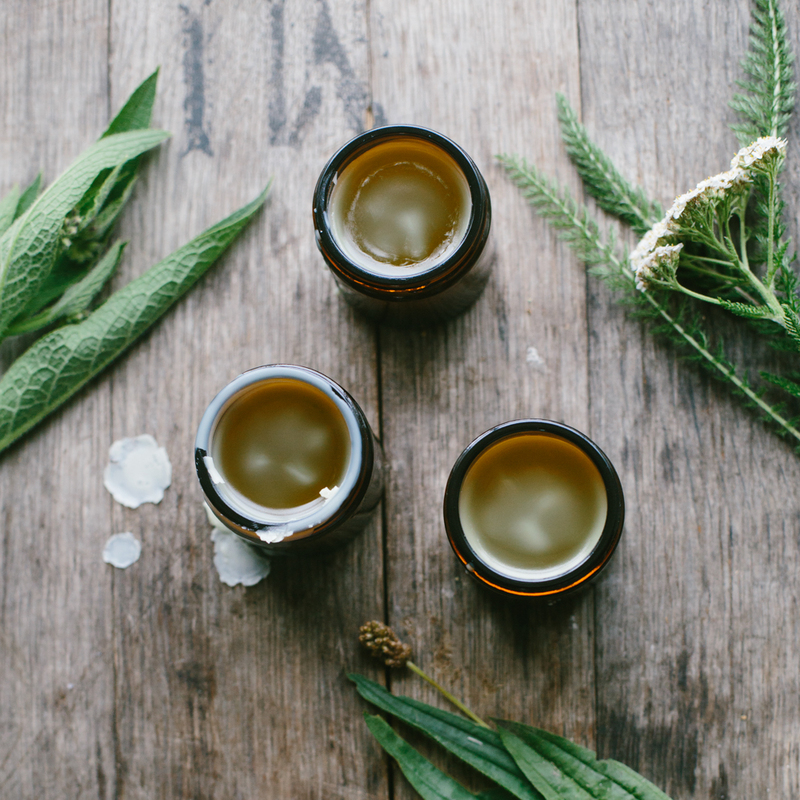 The balm is based on yarrow, comfrey and plantain infused olive oil and thickened with beeswax. This process of infusing and oil and then thickening it with wax is a great technique for making all manner of balms. We also make a lovely calendula balm in a similar manner. 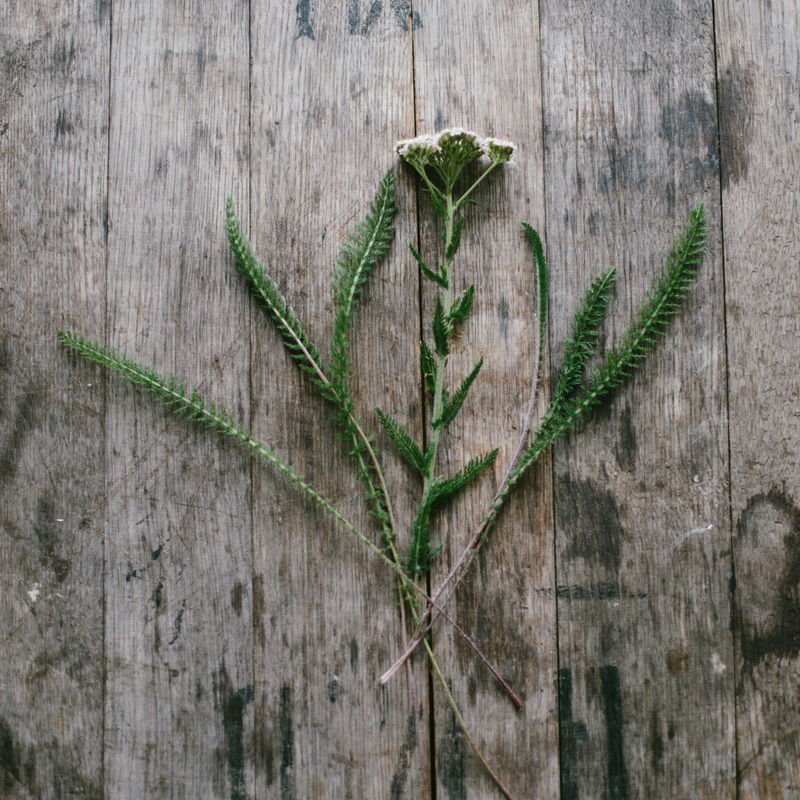 Yarrow: a hedgerow relative of the sunflower, its scientific name Acheallia Millefolium relates both to the invulnerability powers it supposedly gave Achilles and its highly segmented, feathery leaves. It has a peppery smell and likes dry environments. It has a range of uses, but in a salve it helps stop bleeding and has anti-inflammatory properties. 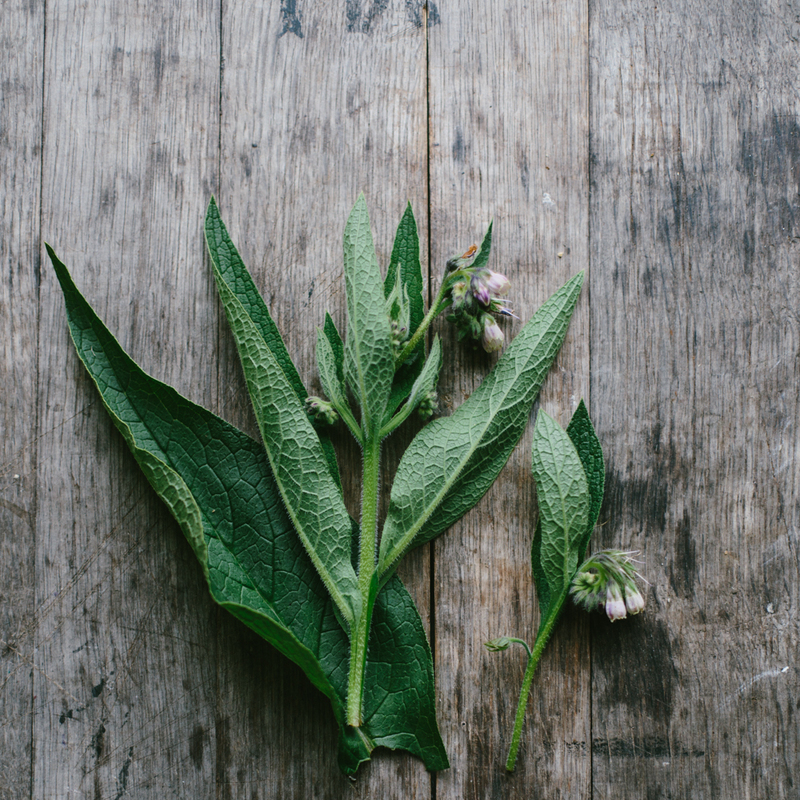 Comfrey: Large, green furred leaves with purple flowers. Its used for healing wounds and broken bones, in fact traditionally it was called "knit bone". It has been shown to enhance cell production and is mildly astringent, helping to kill bacteria. Plantain (both narrow leaf and broad leaf plantain): the long veins in this plant are the key identifiers. 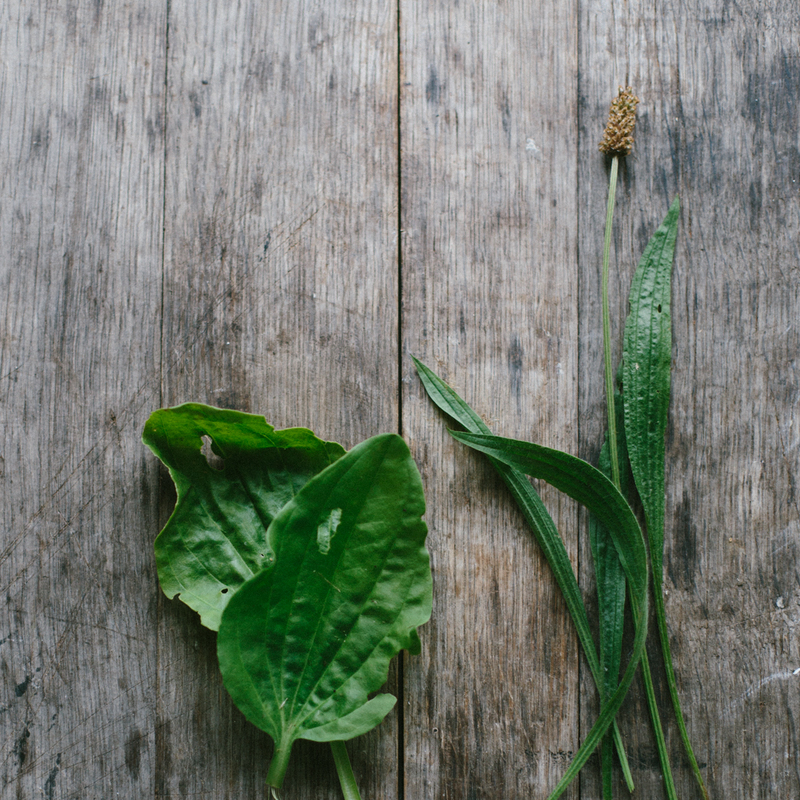 Plantain is great to stop itching and is known as a sort of hedgerow panacea, with antimicrobial, antibacterial and anti-inflammatory properties. Used together, these three hedgerow powerhouses are my favourite blend for the scrapes, brusies, bug bites, nettle stings, scraped knees, sunburn and chapped lips. Note on picking from the hedgerow: To harvest herbs responsibly - never take more than 10% of a plant and look to harvest in areas that aren't heavy in traffic and haven't been sprayed. You may well find all of these in your garden, I know I can. 1. Place your herbs in a glass jar and cover with olive oil. Let it infuse for 4 weeks in a warm spot. Ensure your herbs are fully covered in oil as anything exposed to the air may grow mould. 3. If you would like to add essential oils, do it once the pellets have all melted. We don't use essential oils and don't miss it from this salve. 4. Pour into jars and let cool. Label and save. We like to have a couple of small jars for handbags and backpacks and one large jar that just sits on the counter. We are running a new Natural Home and Beauty course this autumn if you want to learn more about making your own cleaning and natural beauty products.